David Lyon can be reached at harris.lyon@verizon.net. 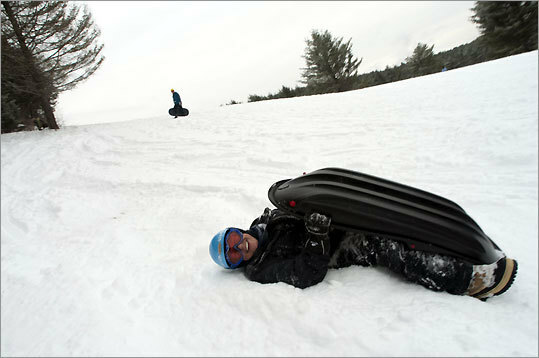 Photos Sledding in Stowe, Vt.
Open daily 9 a.m.-6 p.m. Performance sleds rent for $15 per day per sled. Free performance sled demo day on Feb. 22 from 10-3 at Marshall Hill, Stowe. The sleds are also for sale, but at these prices they're definitely in the try-before-you-buy category: Mad River Rocket Killer B black $125, Airboard $229, Hammerhead $299. There are children's versions of the Rocket ($84) and Airboard ($59). Well-maintained small motel halfway between Stowe village and the ski resort offers one- and two-room units, both with and without cooking facilities. Rates $75-$135 per night. Open Monday-Saturday for lunch and dinner, Sunday for lunch. Fifties fantasy diner a short walk from the sled slope is good for a snack or a warm-up. Burgers and sandwiches $3.35-$7.99. Open daily for lunch, dinner, and late-night pub fare. Entrees $8.95-$17.95.